Possibly the most private LBJ lakefront property in all of Horseshoe Bay with 351 feet of lakefront and over 2 acres to spread out. 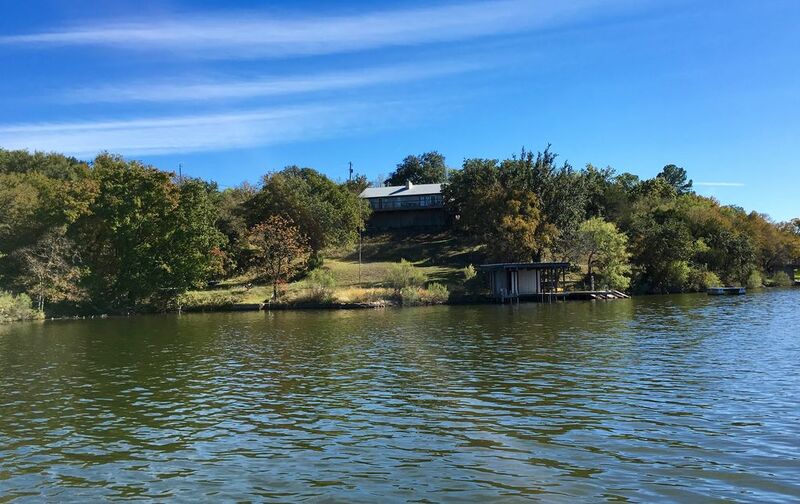 The two bedroom 1465 square foot cottage sits some 40 feet above the water providing expansive views of the Sandy Creek arm of Lake LBJ as well as Packsaddle Mountain. Our house, Shadyside/Vita Umbratilis, is ideal for active families and the still active 55+ couples. It is the rental property for people who value open space and the ability to walk about without bumping into neighbors. It is your time for living in the shade. The two bedroom two bath house has an open floor plan with a fully equipped kitchen. Dining table accommodates eight and bar area has four stools. The 600 sq. ft. cedar deck faces Lake LBJ. Jet ski ramps, a 24 foot boat slip with heavy duty boat lift and a swim platform come with the property. Boat and jet ski rentals are available on the lake. Walk down to the dock and jump into your boat and immediately you have one of the best smooth water ski/wakeboard areas on Lake LBJ. Blue Lake is a suburban style community bordering rural areas. Wildlife seen on property includes Great Blue Heron, Kingfisher, Osprey, Humming Bird, Deer, Fox, Raccoon, Skunk, Beaver, Squirrel. Please respect the wildlife both for your safety and theirs. Please be respectful of our neighbors who have chosen Blue Lake for its beauty and quiet. Major grocers (e.g. HEB) are in Marble Falls (16 miles) and Kingsland (15 miles) and the upscale Bayside Market in HSB about 6 miles. Winter Monthly Rentals for Snowbirds: Unique opportunity for 55+ snowbirds looking to spend the winter months lakeside. Have the best of both worlds, a secluded large lakefront lot across from the fifth fairway of the Blue Lake Golf Club. Enjoy the hospitality and camaraderie at the Club House events with permanent residents (many of which are retirees) while having your own private retreat. The Blue Lake community is not suitable for vacationers who want to be able to pop around the corner to pick up a few items. Moreover we rent only to mature adults and families. We do not rent to those seeking to have a weekend party house on the lake. NOTE - This property is located within Horseshoe Bay city limits in the POA of Blue Lake. I have lived in Austin over 40 years since starting grad school at UT Austin. Met my wife of 30+ years, Sandra, also at UT. We have an active life style and have enjoyed outdoor activities at our lake house since the late 90's. We fell for this property when we saw how secluded it was. For the most part you cannot see any of our neighbors. The houses across the lake are several hundred feet away which gives you a sense of privacy. We thought it was the perfect weekend home to spend time with our children, and hopefully some day grandchildren. The notable attraction is the great space to stretch out, the vistas of Lake LBJ with the house 40 feet above the water and 200 feet back. Property includes a swim platform. Blue Lake Estates is basically a suburban community nestled in a rural setting with Hill Country fauna and flora. Blue Lake Golf Course is across the street. Living Room and Master open up onto 600+ deck overlooking Lake LBJ. Deck is 40 feet above and 200 feet from water. Property has 351 feet lake front on Lake LBJ with swim platform. Large wood decked ock including 24 foot slip with heavy duty boat lift and jet ski ramps available for guests. Calling Packsaddle a mountain may be a stretch for most , but it held great significance for the Comanches (Nine Years with the Indians, 1870-1879, Lehrmann). Best view is at the top of the drive. Living room with L shaped couch (including one hide a bed). 30" inch TV with cable (Northwood) in cabinet. Fireplace. Fully Equipped. Note kitchen has a step down. Single living area with dining table with leaf accommodates up to 8 people. Additionally 4 bar stools with counter. Weber charcoal grill available on deck. Offset smoker on stone patio. There is a raised 600+ sq ft deck overlooking the lake about 40 feet above the water providing expansive views of water and Packsaddle Mt. 800 sq feet stone patio surround front of house. Blue Lake Golf Club is across the street (5th fairway). It is currently ranked as 17th best 9 hole course in Texas, with aspirations and commitment to raise in ranking. The Texas Hill Country provides extensive recreational opportunities including several state parks within 45 minutes of our lake house (e.g. Inks, Enchanted Rock). There is a lot of history especially the Indians who dwelled here (Packsaddle Mt). A number of hill country wineries are 15-20 minutes away and most within 45 minutes drive. In addition to jet skiing, wake-boarding, skiing, there is bass fishing and when the water is flowing even fly fishing on the Llano River. Kurt's house on the lake was well equipped and very clean. We enjoyed our time there even though the lake was low due to previous flooding. The lake level was restored 2 weeks prior to our departure and we were able to catch bass right from the dock. We stayed from early Feb thru mid March and Kurt was a very gracious host. If we had any issues or questions about the property or the area in general, he was very quick to respond. I would highly recommend this property to anyone interested in staying at the lake. The lake is very popular for jet skis and boating and the view of the lake from the huge deck is wonderful. It was a delight to have such wonderful Winter Texans spend a significant portion of their winter lodgings at our lake house. LCRA typically lowers the lake once every 4-6 years so that lakeside owners can make dock repairs. We were able to rebuild our PWC ramp. As this is the second lowering in a couple of years it will likely be a while before it is again lowered. We have plans to make some improvements this year benefiting our guests whenever in the year the stay. Great location: great view, comfortable beds, well furnished. Rare lakefront home with trees, dock, and privacy. Close to amenities, golf course, and wildlife. Look forward to returning after fireplace repair is complete. Knowing a return visit is possible I will move the fireplace repair and upgrade further up a long list of improvements we have planned in 2019. Glad you enjoyed your winter stay on the lake. My husband and I spent our 15th anniversary here and LOVED IT! The location is absolutely wonderful. The house is in a neighborhood, but it is set back from the street and is so private you feel like you are on your own personal island while you are there. There is a deck that overlooks the lake that is perfect for eating outside or stargazing, the house itself is very comfortable and has a well equipped kitchen. We slept better in the king size bed than we ever sleep at home. I'd love to know what kind of mattress that is and I will be buying the same brand of pillows. The lake access is a very short walk down a hill and it is very easy to get into and out of the water. The little deck off the boat house is great for catching some sun or sitting in the shade. Our goal was to go somewhere that we could swim without a lot of kids around and we certainly accomplished that. There were boats and jet skis going by (it was the last weekend before school starts for a lot of people), but most of them were very considerate of the other people around the lake. We enjoyed the perfect mixture of sun and storms - and while we were waiting out the storms we sat on the very comfortable couch and watched music documentaries of AXS network. We will book again, and next time we will bring kayaks. I appreciate how well you captured the place, in particular how it can feel like a private island. I may appropriate that for my description. You commented also on the great stargazing, which is often what my friends say when we have them out overnight. Fortunately there is not an excess of lighting in our neighborhood. I do hope you will return and hopefully by then I will have picked up a couple of kayaks to make available to my guests. Not likely to be as nice as your personal ones but I had already started looking at options for sit on top recreational kayaks that will hold up and still provide comfort and decent tracking. Thanks. I have always thought the property was great and not just because we have a lot of space on Lake LBJ. As time and resources become available we are working to highlight the property with features to enhance its use. Probably the most requested amenity we are asked about is now scheduled to be delivered in the fall, a boat lift for the open guest slip that can accommodate those larger modern boats. This is the perfect place for a winter Texan or a family looking for old fashioned summer vacation fun. Clean, nicely appointed, charmingly old fashioned. The key differences between this place and the other lake LBJ choices are that this one has an incredible view, is nestled between two wooded lots, deck is half shaded throughout the day, and the home is in a quiet, family friendly neighborhood. It was my pleasure having you stay at Shadyside. I do think the property is quite unique as the property is nestled among trees on both sides so you don't have peering neighbors observing you. It is quite secluded although in an otherwise suburban neighborhood. We had a large group gather for NY weekend and had some overflow that we needed extra rooms for. We rented this house and my guests were very comfortable and happy to be so close! The owners were professional and prompt in answering any questions or assisting our needs. Thank you so much for a nice stay! I am pleased that our home provided additional capacity for you to celebrate time together with your large group of friends. Glad that we were able to facilitate someone so close by. Your inquiry has given me perspective about options this time of year that are not tied to the winter Texans we had targeted to date. Thanks.